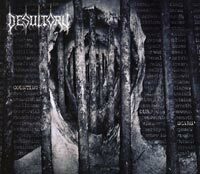 The cult history of DESULTORY begins in 1994. The origins of the cult are three demos (“From Beyond” (1990), Death Unfolds” (1990) and “Visions” (1991), the EP “Forever Gone” (1990) and the metal Blade albums; “Into Eternity” (1993), “Bitterness” (1994) and “Swallow the Snake” (1996). Then the band split up, or rather evolved into the mighty ZEBULON in 1997. The evolution was very much advertised in the changes on “Swallow the Snake”. Can they change back, the question has its foundation in the fact that today´s DESULTORY is altogether a revamped ZEBULON consisting of; the Morberg brothers, Claes and Håkan on vocals/guitars and guitars respectively, Jojje Bohlin on bass and Thomas Johnson on drums. Can´t wait to find out! It´s been 14 years since their last breath and I really look forward to find out if they are anachronisms, have developed or a bit of both. Not least since the ZEBULON connection. I soon realize that I travel both back and remain today. I find it somewhat strange that the title track is not among the strongest efforts. I believe it and “The Moment Is Gone” to be ok melodic death metal. The rest of the album is stronger. The youthful enthusiastic head-on “In a Cage” and the sheer power and double vocals in “Dead Ends” are absolute top-notch of 2011. The melodies, the heaviness, the routine, the enthusiasm and Tore Stjerna´s studio work make “Counting Our Scars” one of the best death metal releases of 2011…already!